AS THE NORTH AMERICAN SEAT of His Holiness, the Seventeenth Karmapa, Ögyen Trinley Dorje Karma Triyana Dharmachakra has been the host to many of the great Kagyu teachers. This partial list includes major lineage figures who have visited Karma Triyana Dharmachakra and some of the many other renowned teachers who, we hope, will in the future turn the wheel of Dharma at the monastery and its affiliate centers in the United States and Canada. THE SIXTEENTH GYALWA KARMAPA, Rangjung Rigpe Dorje, was born in Tibet in 1924. He was recognized by the Eleventh Situpa. 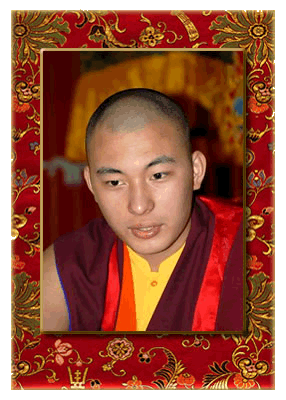 Karmapa Rangjung Rigpe Dorje accomplished extensive retreats in his youth. His Holiness went on pilgrimage to Samye, Lodrak, and then to Bhutan. In 1945, Tai Situpa gave him full ordination vows and further comprehensive Kagyu teachings on the giving of empowerments. He also received from the Nyingma master Urgyen Rinpoche complete transmission of the Nyingma teachings of Terton Chojur Lingpa. In 1959, during the communist invasion that had begun in 1951, the Karmapa left Tibet with portable spiritual treasures and relics and 150 tulkus, monks and lay people. He settled in Rumtek, Sikkim, India. By 1966, the construction of the new Rumtek monastery was complete, and the relics were installed. This was to be the hub from which Kagyu Dharma would spread throughout the world. In 1974, Rangjung Rigpe Dorje set out on his first world tour. He took a second tour in 1977. As did the previous Karmapas, Rangjung Rigpe Dorje performed startling miracles. Numerous times he left footprints in rocks. He once tied sword blades in knots. During a visit to the Hopi reservation in northeastern Arizona, he made rain for the drought-stricken area. 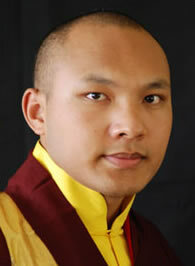 The Sixteenth Karmapa died in 1981 in Zion, Illinois, north of Chicago. After his death, his body remained upright in meditation posture for three days, and the area over his heart was warm. During his cremation, his heart fell from the blazing body. The heart is now a venerated relic, stored in a stupa at Rumtek monastery. Bones that remained after the cremation of Rangjung Rigpe Dorje formed Buddhas and many relics. 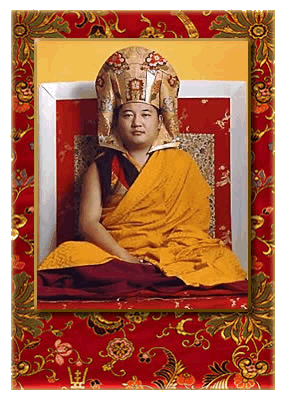 The Sixteenth Karmapa is best known for having brought the Dharma out of Tibet into the Western world. 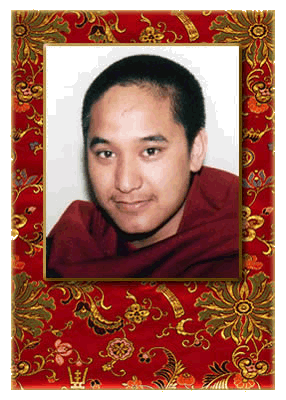 THE FOURTH JAMGON KONGTRUL RINPOCHE was born in the wood pig year in Central Tibet on the 26th of November 1995. His birth was prophesied by The Seventeenth Karmapa, Ögyen Trinley Dorje, who also recognised, confirmed the authenticity of his incarnation, and proclaimed it to the world! The prophecy, the search, and the recognition of His Eminence the Fourth Jamgon Kongtrul Rinpoche are told in the book E MA HO! published by the Jamgon Kongtrul Labrang and can be obtained from Pullahari Monastery and viewed on www.jamgonkongtrul.org. Today, His Eminence spends time between Kagyu Tekchen Ling and Pullahari Monastery, the monastic seats in India and Nepal founded by the Third Jamgon Kongtrul Rinpoche. Jamgon Kongtrul Labrang is prioritising His Eminence’s studies, training, and the receiving transmissions from the Lineage Masters at this time. Though still young in years, His Eminence has started to assume responsibilities of the activities of his predecessors. Annually, he also graces his presence at the Kagyu Monlam in Bodhgaya, India, led by His Holiness the Seventeenth Gyalwa Karmapa, and leads the Kagyu Monlam in Kathmandu, Nepal. At Pullahari Monastery, His Eminence grants daily audiences between 10.30am and 11.30am (except on Wednesdays). Om Swasti! The one whom the Glorious One’s flawless prophecy foretold would accomplish the enlightened activity of all the Victorious Ones, and to whom the great emperors of China paid homage by calling him “Rasuso Huwang, King of the Precious Dharma” is Karmapa, Ogyen Drodul Trinley Dorje. This proclamation is his. To the people of the world, particularly to those residing in Tibet, Great China, India, Sikkim, Bhutan, Nepal, Hongkong, Taiwan, Malaysia, Switzerland, Singapore, Japan, America, and others; to the people of these great lands, to lamas, tulkus, laymen and women of every station, I offer this to you. The third incarnation of this great being, whose coming was foretold in the Victorious One’s flawless prophecy, was without rival in the entire Land of Snow. He was lord of the completely perfect teachings; like a wish-fulfilling jewel, he dispelled the inner torments of all beings. 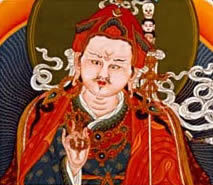 He was the crown ornament of the lineage upholding the definitive meaning, the Karma Kamtsang. It is impossible to speak his name lightly or idly. 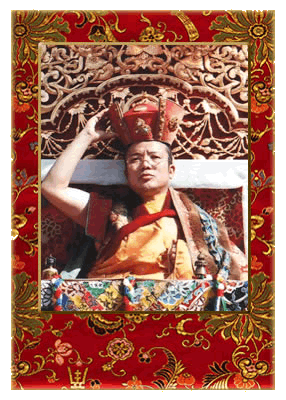 The great sound of his name, “Jamgon Lodro Chokyi Senge,” reduces samsara to shreds. According to his intention he has come again, this great friend of the Teacher’s doctrine and of all beings, even those who do not know him. He was born to the south of the Glorious Karmapa’s seat of Tsurphu, in Chushur district amidst many villages, the circumstances of his birth being in accord with my description in the Letter Describing the Signs earlier, held in faith by gods and men. Now in this special purpose, I offer, to the son born in the year of the Pig to Yab Gonpo and Yum Yangkyi, this recognition as being the genuine reincarnation of the Third Jamgon Kongtrul Lodro Chokyi Senge. I hereby bestow upon him the name Jamgon Lodro Chokyi Nyima Tenpey Dronme Chok Thamched Le Nampar Gyalwe De. I sing his praises, and empower him to sit on the towering throne of Dharma. All sentient beings should examine the legacy of his predecessors, respect him, serve him, and pay him homage. Even though he has not reached adulthood, all should hold this supreme tulku in only the highest regard. The one whom the Great Fourth prophesied in many sutras and tantras, and whom the Second Victor, the Great Guru, also foretold, was the genuine being Jamgon Kongtrul Lodro Thaye. His name was renowned as the sun and moon. 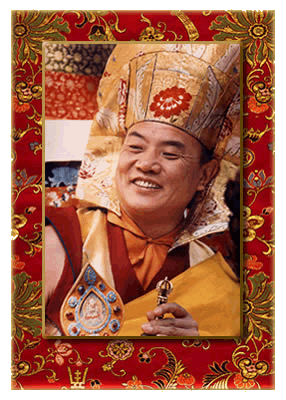 The Third in the garland of his incarnations was the great Jamgon Kongtrul Lodro Chokyi Senge, whose reincarnation has now indisputably appeared. Being completely certain as to his authenticity, I have bestowed upon him the name Jamgon Kongtrul Lodro Choyki Nyima Tenpey Dronme. And I hereby request all unbiased and supreme tulkus, and the sangha of scholars and masters, to pray that through this supreme tulku’s mastery of the Three Wheels and the three types of scholarship, he may bear the awesome responsibility of disseminating the Great Fourth’s flawless teachings throughout the hundred directions, and in so doing make his predecessors’ legacy his own; that his lotus feet be unshakeably planted here on earth; that he be as indestructible as the vajra; that he and his activity be surrounded by only the most excellently favourable conditions; and that these favourable conditions increase and increase. I request all the aforementioned to give whatever assistance to him that they, in their wisdom, know to be necessary. This proclamation of the authenticity of the Fourth in the garland of emanations of Jamgon Kongtrul is made by Karmapa Ogyen Trinley Dorje in his Seat of the Pure Land of Tsurphu. DZOGCHEN PONLOP RINPOCHE was born at the new Rumtek Monastery in Sikkim on June 24, 1965. His father was Dhamcho Yongdu, the General Secretary of His Holiness Karmapa. At an early age, Rinpoche received refuge vows and novice monk vows from His Holiness Karmapa. He has received most of his Kagyu and Nyingma teachings and empowerments from His Holiness Karmapa, His Holiness Dilgo Khyentse Rinpoche, and other great teachers. In 1980, Rinpoche first traveled to North America and Southeast Asia with His Holiness Karmapa, giving dharma teachings and assisting with many ceremonies. Rinpoche is president of Nitartha International, where he oversees activities in preserving Asian literature and manages Nitartha's educational and preservation programs. Rinpoche is acknowledged as one of the foremost Asian scholars of his generation, and is also familiar with contemporary Western methods of scholarship and education. A graduate of Karma Shri Nalanda Institute, an affiliate of Sampurnanand Sanskrit University in Varanasi (U.P.) India, Rinpoche has also completed courses of studies in English and comparative religions at Columbia University in New York City. Over the years years, Rinpoche has become increasingly adept at applying personal computer technologies to education and archival preservation. Rinpoche is also accomplished in the visual arts. In 2003, he founded a new international events center for Nalandabodhi in Seattle, Washington as a place for genuine teachings and transmission of Buddhism to the West. 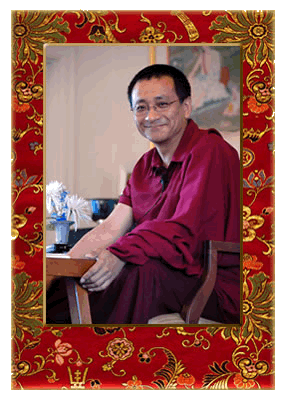 For a more extensive biography, please visit Dzogchen Ponlop Rinpoche's website. CHOGYAM TRUNGPA RINPOCHE was the first great lama sent by His Holiness the Sixteenth Gyalwa Karmapa to the West. Trungpa Rinpoche was fluent in English and authored many Dharma texts that caught the attention and devotion of Western students. 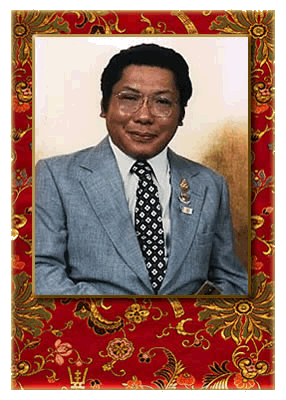 Trungpa Rinpoche was instrumental in paving the way for His Holiness Karmapa's first visit to the United States, and himself visited and taught at the Karmapa's seat-to-be at Karma Triyana Dharmachakra in the late 1970's. Trungpa Rinpoche's devoted students provided this brief biography. May it inspire all who see or hear it. Trungpa Rinpoche was born in 1940 in the province of Kham in Eastern Tibet. 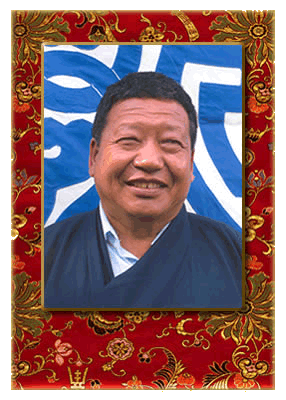 He was recognized as the eleventh incarnate teacher in the teaching lineage known as the Trungpa Tulkus. Trungpa Rinpoche was enthroned as Supreme Abbot of Surmang Monasteries and Governor of Surmang District. When he was eight years old, Rinpoche received ordination as a novice monk. In 1958, when he was 18 years old, he completed his studies, receiving the degrees of Kyorpon (doctor of divinity) and Khenpo (master of studies). As a Kagyu tulku, training was in meditation and philosophy, and the practice of traditional monastic disciplines, as well as the arts of calligraphy, thanka painting, and monastic dance. Trungpa Rinpoche received full monastic ordination. His primary teachers during his eighteen years of training in Tibet were Jamgon Kongtrul of Sechen and Khenpo Kangoshar, teachers from the Nyingma and Kagyu lineages. Due to the Communist invasion of Tibet, Rinpoche fled to India in 1959. In 1959 the Fourteenth Dalai Lama, His Holiness Tenzin Gyatso, appointed Rinpoche to serve as spiritual advisor at the Young Lamas Home School in Dalhousie, India. In 1964 Rinpoche received a Spaulding Scholarship at Oxford University, where he studied comparative religion, philosophy, and fine arts. He took great interest in Japanese flower arranging, and received a degree from the Sogetsu School. In 1967, he founded Samye Ling Meditation Center in Dumfriesshire, Scotland. In 1969, Trungpa Rinpoche went to Bhutan to do a solitary retreat. This retreat was a turning point in his life, because soon after the retreat, he put aside his monastic robes, became a lay person, married a young Englishwoman, and moved to North America. Trungpa Rinpoche taught in North America and Europe 17 years, and was one of the first lamas to become fluent in the English language. He taught and travelled extensively, had many students, and established many meditation and study centers. In 1973, Vajradhatu was formed as the central administrative body of Rinpoche's centers. Rinpoche founded in 1974 the Naropa Institute, the only accredited Buddhist-inspired university in North America. Later he formed the Nalanda Translation Committee to translate texts and liturgies. In 1976, he established the Shambhala Training program, which provides instruction in meditation practice within a secular setting. The Shambhala Teachings are a complete path to Enlightenment, and stress mind-training, community involvement and the creation of an enlightened society. In 1976, Trungpa Rinpoche appointed his American disciple, Osel Tendzin (Thomas F. Rich), as his Vajra Regent (Dharma heir). Osel Tendzin assisted Rinpoche in the administration of Vajradhatu and Shambhala Training, and taught from 1976 until his death in 1990. In 1978, Rinpoche empowered his son Osel Rangdrol Mukpo as his successor in the Shambhala lineage and gave him the title of Sawang (earth lord). Trungpa Rinpoche was a great meditation master, scholar, and artist. He wrote many books and articles, and his art work included poetry, calligraphy, painting, play writing, flower arranging, and environmental installations. He had particularly profound insights into the relationship between the contemplative discipline and the artistic process. Trungpa Rinpoche died in 1987, at the age of forty-seven. He is survived by his wife Diana, and five sons. His eldest son, Osel Rangdrol Mukpo, succeeds him as president of Vajradhatu. Trungpa Rinpoche was able to present the Dharma to his Western students in the English language. He joined together the Eastern and Western minds, and fearlessly proclaimed the Dharma in the Occidental world. THE SEVENTH KARMAPA founded the Thrangu Monastery some 500 years ago and appointed one of his most gifted disciples to be its abbot. This was the First Thrangu Rinpoche. More recent incarnations have spent much of their lives in retreat. The Ninth Thrangu Rinpoche was born in 1933 in Kham, Tibet. At the age of five, he was recognized by His Holiness the 16th Gyalwa Karmapa and the Eleventh Palpung Situ Rinpoche. During childhood Thrangu Rinpoche studied reading, writing, grammar, poetry, astrology, and other subjects at Thrangu Monastery. When Thrangu Rinpoche was twenty-three, along with Sumang Gawang and Chogyam Trungpa, he received the Gelong ordination (monk's vows). For the next several years, he received many initiations, engaged in religious practice and retreats, and was introduced to the Absolute Nature by Lama Khenpo Gausha Wangpo. Rinpoche is the highest scholar of the Kagyu school and has been responsible for the education of the highest tulkus of the Kagyu order including H.E. Tai Situ Rinpoche, H.E. Jamgon Kongtrul Rinpoche, and H.E. Gyaltsab Rinpoche. He is a full holder and teacher of the Kagyu Vajrayana lineages and holds a direct transmission of the special shentong philosophical tradition. He is now the khenpo (abbot) of Rumtek Monastery and Nalanda Institute for Higher Buddhist Studies, in Rumtek. He founded his own shedra (school), Thrangu Tashi Choling, in Nepal. He has also travelled extensively throughout Europe and the United States. In Sarnath, India, Thrangu Rinpoche completed a large, beautiful monastery overlooking the Deer Park where the Buddha gave his first teaching on the Four Noble Truths. This monastery is named Vajra Vidya after the Sixteenth Gyalwa Karmapa, and it is now the seat for the annual Kagyu conference led by His Holiness the Seventeenth Gyalwa Karmapa. 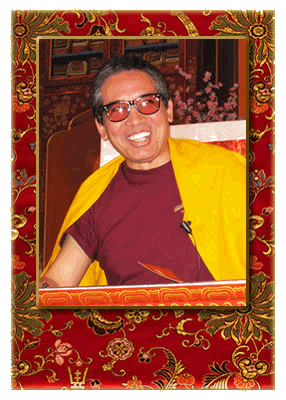 In Crestone, CO, Thrangu Rinpoche founded the Vajra Vidya Retreat Center. 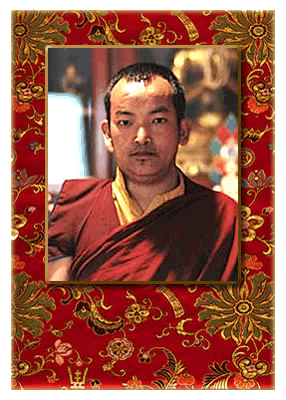 Click here for a more extensive biography of Khenchen Thrangu Rinpoche. TENGA RINPOCHE was recognized as one of the tulkus of the great Benchen Monastery in eastern Tibet. Since the history of his lineage is closely interwoven with the incarnations of Sangye Nyenpa Rinpoche, it is helpful first to look at the history of that lineage. After living in the area of Dege for three lifetimes, the fourth tulku of Sangye Nyenpa, Gelek Jantsho, traveled to nearby Ga, a countryside he liked very much and considered suitable for building a monastery, provided that the right auspicious omens occurred. One day as Gelek Jantsho was standing near a huge boulder, a large black raven descended from the sky, alighted there and gave a cry. Gelek Jantsho went closer to look at the raven and saw it drop from its beak a small turquoise image of the protector Dorje Bernachen and then it danced around on top of the rock. He realized that the raven itself must be an emanation of the protector. As this was an especially good omen, he decided on that spot as the site for his monastery and kept the small image of Mahakala for his shrine. Gelek Jantsho then went to the local chief, Rarda Pontshong, and told him this story, requesting that land be made available for the construction of the monastery. Deeply impressed, Rarda Pontshong offered the very land on which stood his family home, a large black tent, and said he would help with the project in any way he could. 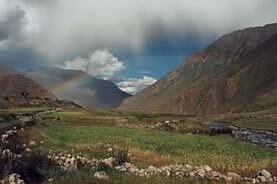 During the building of the monastery, tremendous gales, hail storms, and strange manifestations upset the progress. Gelek Jantsho realized that they were probably caused by the displeasure of the Rarda family protector. He told Rarda Pontshong of the problems and having learned that the protector was Shing Kyong, Gelek Jantsho resolved that he would dedicate himself to meditation on this protector and that Shing Kyong would always be the protector of his teachings. He built a shrine for Shing Kyong, who is still the special protector of all those associated with Benchen monastery, and the building was completed without further obstacles. The story of the Tenga incarnations starts in the time of the eighth Sangye Nyenpa, Tenzin Drupchok, one of whose students was a highly accomplished lama named Gonkhen Samten. The title Gonkhen means "expert on the protectors" and was given to him for his proficiency in Shing Kyong meditation. 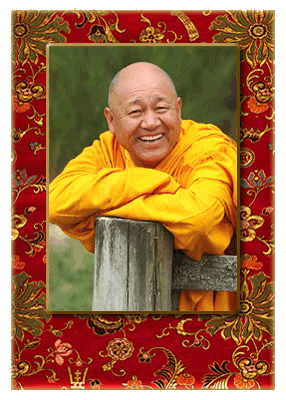 Lama Samten spent most of his life in retreat, meditating on his yidam, Karma Pakshi, and Shing Kyong. Many people came to see him for his blessing, which cured all kinds of medical and other problems. Several years after Lama Samten died, Tenzin Drupchok travelled to Lhasa and on the way met a local chief named Drungpa Pontshong, who requested initiations. While Tenzin Drupchok was staying with the local chief, he met in this family a small boy, who asked if he wouldn't give back his thigh bone trumpet. Tenzin Drupchok immediately recalled that just before dying, Lama Samten had given him his thigh bone trumpet and asked him to look after it for a while. At last he had met the reincarnation of Lama Samten. A couple of years later, returning from Lhasa to Benchen Monastery, Tenzin Drupchok stopped by the little boy's house and the family gave him the boy to take along. 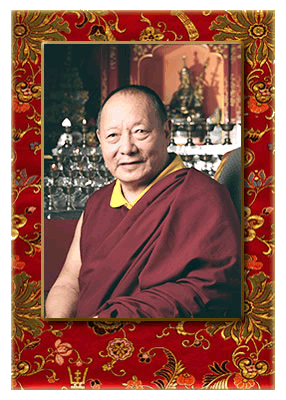 Soon after his arrival at the monastery, he began to study the theory and practice of the Karma Kagyu tradition, at which he excelled, memorizing in one year all the rituals and songs of Benchen. As a young man, he was given ordination by Tenzin Drupchok and the name Karma Tenzin Chogyal. Then when he was about eighteen, Tenzin Drupchok told him about Lama Samten, who had been such a distinguished lama that Tenzin Drupchok had high hopes for the future. To realize this promise, he suggested that Tenzin Chogyal go on retreat under the guidance of the great Jamgon Kongtrul. Tenzin Chogyal followed this advice and traveled to Pepung Monastery to meet Kongtrul Rinpoche. With his instruction, the young monk completed a very successful three-year retreat and became Kongtrul Rinpoche's attendant for another three years. Kongtrul Rinpoche was very impressed with him, and when he had to go to Lhasa, he left Tenzin Chogyal in charge of his retreat center. After a few years, Kongtrul Rinpoche returned and told Tenzin Chogyal that since he was now equal to himself in realization, it was time to return home to Benchen. One of the parting gifts Kongtrul Rinpoche gave him was a painting of six-armed Mahakala, which is still with the present Tenga Rinpoche. By the time Tenzin Chogyal came home to Benchen, Tenzin Drupchok had died and so he had to take over the direction of the monastery and the education of the new Sangye Nyenpa, Gelek Drupe Nyima (who died about twenty years ago). In addition to this work, one of Tenzin Chogyal's greatest accomplishments was the construction of four retreat centers at Benchen: for Jinasagara (a high tantra form of Chenrezig), for Kunrik (a form of Vairocana and this retreat also included White Tara and Shing Kyong), for the six doctrines of Naropa, and for the six doctrines of Niguma. When Tenzin Chogyal was an old man, he told his monks that since he was getting old and things were becoming difficult for him, he would leave Benchen and go to live in "some pleasant garden." They all sympathized with him and thought that this was a very good idea. He told Sangye Nyenpa the same and gave him some of his possessions, including the painting of six-armed Mahakala, to look after while he was away. A few days later, he died. Some years later, Situ Pema Wongchuk visited Benchen and Sangye Nyenpa asked him how he might find the incarnation of his lama, Tenzin Chogyal. Situ Rinpoche predicted the name of the father and mother of the child, the year of his birth (1932), and said that Sangye Nyenpa would not have to look far, but would find the child within the vicinity of Benchen. After a search, they found the child (the present Tenga Rinpoche), who was seven years old. 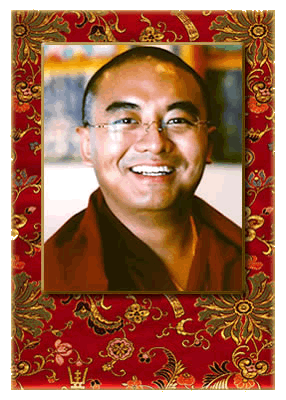 He then began his studies at Benchen and received refuge and the name Karma Tenzin Thinle Namgyal from Situ Rinpoche. At sixteen, he was instated as a tulku and in the next years took the opportunity to learn medicine from an uncle, who was both a lama and a doctor. At nineteen, he received ordination from Situ Rinpoche and when his studies were completed, he entered a three-year retreat. During this time, he became particularly adept at White Tara meditation (his yidam) and tummo. It is said that in the retreat, his water bowls were the only ones which did not freeze over in the winter. In 1959, as a result of the Chinese invasion, Tenga Rinpoche left Benchen for Lhasa and then northern India. Following his arrival in India, he went to Rumtek, the seat of His Holiness the Gyalwa Karmapa, where Rinpoche served as dorje loppon (vajra master) for more than nine years. In 1974, he traveled with the Karmapa to the West. Since then, he has traveled extensively in the West, giving teachings on Buddhism. Every two years, he teaches a three-week seminar in Germany, where many of his students reside. In 1986, Tenga Rinpoche established the new Benchen Monastery in Kathmandu, at the foothills of Swayambhu. At present, this monastery is the center for traditional ritual practice of the Karma Kamtsang lineage. The monks, under the guidance of both Tenga Rinpoche and Sangye Nyenpa Rinpoche, are trained in meditation and Dharma studies in general, and particularly the traditional tantric rituals such as sand mandalas and lama dances. Twice a year, they perform the Mahakala and Padmasambhava lama dances. Fulfilling the wishes of Tenga Rinpoche and Sangye Nyenpa Rinpoche, a health clinic was started in 1994. This clinic provides free medical care not only for the monastery, but also for local people who cannot afford such care. A retreat center has been built in the area of Parping, twenty kilometers from Kathmandu, as part of Benchen Monastery. This will provide the traditional three-year retreat for the monks, as well as accommodations for shorter and longer retreats for lay people. YONGEY MINGYUR RINPOCHE is a highly venerated teacher and master of the Karma Kagyu lineage of Tibetan Buddhism. He was born in Nepal in 1975, and was recognized as a tulku by both His Holiness the Sixteenthth Karmapa and His Holiness Dilgo Khyentse Rinpoche. When Rinpoche was nine, he moved to the hermitage of Nagi Gompa in Nepal to study mahamudra teachings, as well as instructions on the trekcho and togyal aspects of dzogchen with his father, Tulku Urgyen Rinpoche, one of the greatest dzogchen meditation masters of our time. When Mingyur Rinpoche was eleven, he was invited by His Eminence Tai Situ Rinpoche to study at Sherab Ling in northern India. There he learned the practical applications of the daily rituals of Karma Kamtsang and the tantras according to the tradition of Marpa. Rinpoche also completed all required studies at the monastic college or shedra. 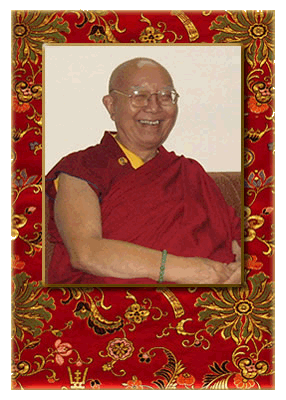 At the age of thirteen, Rinpoche entered a traditional three-year retreat. At age of seventeen, he was asked by His Eminence Tai Situ Rinpoche to become the retreat master and at the age of twenty, Tai Situ Rinpoche asked Mingyur Rinpoche to become assistant Khenpo of Sherab Ling where a new monastic college was established under Mingyur Rinpoche's guidance. One of his current projects is the building of Tergar Institute in Bodhgaya, India, which will server large numbers of people attending Buddhist events at this sacred pilgrimage site, serve as an annual site for month-long Karma Kagyu scholastic debates, and serve as an international study institute for monastic and lay sangha. The institute will also have a medical clinic for local people. Mingyur Rinpoche teaches actively in the West and is known for his remarkable ability to convey the Buddhist teachings in a clear and skillful manner. Visit the website for http://www.tergar.org. 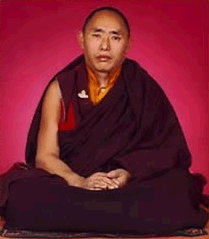 THE FOURTH KARMA KHENCHEN RINPOCHE, Karma Shenpen Chokyi Dawa, an emanation of Shantarakshita, was born in 1976. His father is the scholar and siddha, the Seventh Nendo Karma Chakme Rinpoche. His mother is Pema Lhamo. The Sixteenth Karmapa, Rangjung Rigpe Dorje, unerringly recognized him as the emanation of Karma Khenchen Rinpoche when he was very young. 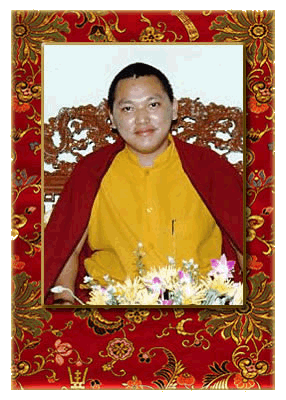 The Karmapa cut his hair (gave him refuge) and he was enthroned at the great seat of Rumtek Monastery. As in his previous emanations, he learned reading and writing and heard teachings on the dharma, both sutra and tantra. In 1987 he went for the first time to his previous seat, the second great seat of the Karmapa, Ogmin Karma Gon, in the province of Kham. In 1992 he returned there, visited many monasteries, and gave the empowerment and transmissions of the Kagyu Ngag Dzod Chenmo to many people. He also gave extensive teachings, restored several monasteries that had been destroyed, and built three new meditation retreat centers. All of his activities were for the propagation of the Buddha's teachings and to the great benefit of all beings. In February 1999, he visited the West to teach at Karma Triyana Dharmachakra and its centers, disseminating the dharma of sutra and tantra. KALU RINPOCHE was born in 1905 in eastern Tibet. During his early years, he was tutored by his father at home and received a thorough grounding in the meditative and ritual traditions of Tibetan Buddhism. When Kalu Rinpoche was fifteen years old, he was sent to begin his higher studies at the great monastery of Palpung, the foremost center of the Karma Kagyu school. He remained there for more than a decade, during which time he mastered the vast body of teaching that forms the philosophical basis of Buddhist practice and completed two three-year retreats. Rinpoche's gurus included the foremost disciples of the supreme master of the Eclectic Movement, Jamgon Kongtrul Lodro Thaye. Among them were the Fifteenth Gyalwa Karmapa Khakhyab Dorje; Eleventh Tai Situ Pema Wangchuk Gyalpo, the abbot and foremost teacher of Palpung monastery; Zhechen Gyaltsab Byurme Namgyla, the great Nyingma master who was regarded as Mipham Rinpoche's unequaled disciple; and the meditation master Drupon Norbu Donrdrup, whose teaching had a profound impact on Rinpoche's life. At the same time, his Dharma brethren included the foremost masters of his generation: Kongtrul Khyentse Ozer, Zhechen Kongrtrul Rinpoche, Jamyang Khyentse Choki Lodro, Dingo Khyentse Rinpoche, and many others. At age twenty-six, Rinpoche left Palpung to pursue the life of a solitary yogi in the woods of the Khampa countryside. For nearly fifteen years, he strove to perfect his realization of all aspects to the teachings and he became renowned in the villages and among the nomads as a true representative of the Bodhisattva's path. Rinpoche's simple and direct style of teaching is in many ways the product of the need to bring the living experience of the Buddha's teaching to those who had not benefited from the sophisticated educational system of the monastic system. It was thus with an established mastery of meditative practice that Kalu Rinpoche returned to Palpung to receive final teachings from Drupon Norbu Dondrup, who entrusted him with the rare transmission of the teaching of the Shangpa Kagyu. During the 1940's, Rinpoche visited central Tibet with the party of Situ Rinpoche, and there he taught extensively. His disciples included the Reting Rinpoche, regent of all Tibet during the infancy of the Fourteenth Dalai Lama. Returning to Kham, Rinpoche became the abbot of the meditation center associated with Palpung and the meditation teacher of His Holiness the Sixteenth Gyalwa Karmapa. He remained in that position until the situation in Tibet forced him into exile in India. 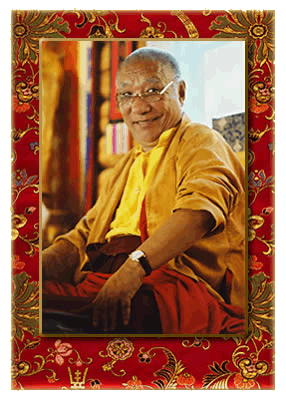 Kalu Rinpoche has taught extensively in America and Europe, and during his three visits to the West he had founded teaching centers in over a dozen countries. In France, he has established the first retreat center ever to teach the traditional three-year retreats of the Shangpa and Karma Kagyu lineages to Western students. BOKAR RINPOCHE was born to a nomadic family in Western Tibet. He was recognized at age four by His Holiness the Sixteenth Gyalwa Karmapa as the reincarnation of the previous Bokar Rinpoche. Bokar Rinpoche left Tibet at age twenty and at that time met the great meditation master Kalu Rinpoche. Beginning in 1967, under the guidance and direction of Kalu Rinpoche, Bokar Rinpoche stayed in retreat for three years, practicing the Six Yogas of Niguma. After that, he did another three-year retreat for the Six Yogas of Naropa. Bokar Rinpoche became the retreat master of the retreat center at Sonada, and later His Holiness appointed him master of the new retreat facility at Rumtek as well. Due to his remarkable qualities and deep realization, Bokar Rinpoche was considered the spiritual heir of Kalu Rinpoche, and holder of the Shangpa Kagyu Lineage. In June of 1996, Bokar Rinpoche offered a retreat in the United States on the complete meditative stages in the great Mahamudra tradition of the Karma Kagyu lineage. In response to his experiences with Western students, Bokar Rinpoche formulated this retreat and an accompanying program of meditation practice to meet the needs of sincere lay practitioners of Buddhism. It allowed lay Westerners to remain involved with family and community while nourishing dharma practice by committing an hour a day or more to formal practice. Rinpoche said, "Our approach with the seminar, at the very beginning , was to emphasize not rejecting work, family and so forth-but to integrate a daily practice into one's lifestyle." Through this program, hundreds of students worldwide have received dharma instruction in English, French, Tibetan and Chinese in annual seminars in India, France and North America. Bokar Rinpoche founded a retreat center in Mirik, India, and then, at the urging of the local community, a monastery. Both continue to thrive: the monastery is currently undergoing significant expansion and a second three-year retreat facility is just being completed. Well-known for his emphasis on the importance of long retreats, Bokar Rinpoche was also known for holding the Kalachakra lineage, which he had received from Kalu Rinpoche along with the entire Shangpa Kagyu transmission. Bokar Rinpoche passed away on the morning of August 17, 2004. During the funeral ceremonies present were: His Eminence Gyaltsap Rinpoche and monks from his monastery, monks from His Holiness Karmapa's seat at Rumtek, His Eminence Jamgon Kontrul Rinpoche, and Yangsi Kalu Rinpoche, as well as Drupon Rinpoche, who accompanied Karmapa out of Tibet, and many other lamas. Numerous students from all over the world made the journey. Rinpoche's kind presence will be deeply missed by both his Asian and Western disciples. Much of the information was kindly provided by Kagyu Changchub Chuling. Bokar Rinpoche has written A Brief Biography of H.E. 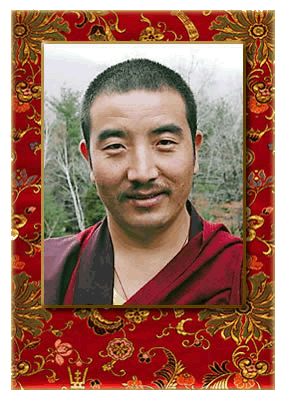 Jamgon Kongtrul Rinpoche that is also included in this section of the Web site. HER EMINENCE Mindrolling Jetsun Khandro Rinpoche is the daughter of His Holiness Mindrolling Trichen. Born into the Mindrolling lineage, which throughout its history has had many accomplished female masters, Rinpoche was recognized at the age of two by His Holiness the Sixteenth Karmapa as the re-incarnation of the Great Dakini of Tsurphu, Khandro Ugyen Tsomo, who was one of the most renowned female masters of her time. Thus, the present Jetsun Khandro Rinpoche came to hold the lineages of both Nyingma and Kagyu schools. Her Eminence Jetsun Khandro Rinpoche received teachings and transmissions from some of the most accomplished masters of the 20th century, His Holiness Mindrolling Trichen, His Holiness Dilgo Khyentse Rinpoche, His Eminence Trulzhig Rinpoche, His Eminence Tenga Rinpoche, His Eminence Tsetrul Rinpoche and His Eminence Tulku Ugyen Rinpoche. Rinpoche has been teaching internationally for sixteen years in both Europe and North America, offering teachings from both the Kagyu and Nyingma schools. Jetsun Khandro Rinpoche established and heads the Samten Tse Retreat Centre in Mussoorie, India which provides a place of study and retreat for monastics and Western lay practitioners, with students from East and West living together in spiritual community. Currently 52 nuns and 30 western students are in residence at Samten Tse. The North American seat of Mindrolling International, is Lotus Garden Retreat Center in rural Virginia, USA, which provides retreat practice, the study of crucial Buddhist texts, and hosts visiting teachers from all lineages. 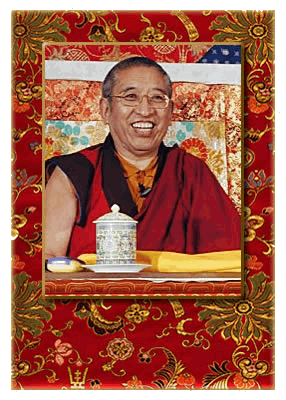 Rinpoche’s book, entitled This Precious Life: Tibetan Buddhist Teachings on the Path to Enlightenment, was published by Shambhala Publications in 2003. KHENPO TSULTRIM GYAMTSO RINPOCHE was born in eastern Tibet in 1934. In his youth, he studied under the guidance of Lama Zopa Tharchin, a yogi from Dilyak monastery in eastern Tibet. Until he completed his training, Khenpo Tsultrim stayed with Lama Zopa, living in a cave. He then went to Dilyak monastery to study Mahayana texts with Teya Drupon. For five years, Rinpoche roamed the charnel grounds and caves of central Tibet to practice Chod. Eventually, he arrived at Tsurphu where he met Dilyak Drupon Rinpoche, whom His Holiness the Sixteenth Karmapa had appointed as the retreat master of Tsurphu. Rinpoche received pointing out instructions from the Sixteenth Karmapa and stayed in the caves around Tsurphu for a year or so, continuing his Chod practice and receiving teachings from Dilyak Drupon, which included the Zabmo Nang Gi Don, The Profound Inner Meaning, and the Hevajra Tantra. While staying in retreat in Nyemo, south of Lhasa, a group of nuns asked for Rinpoche's help in dealing with the troublesome situation of the Chinese presence in Tibet. 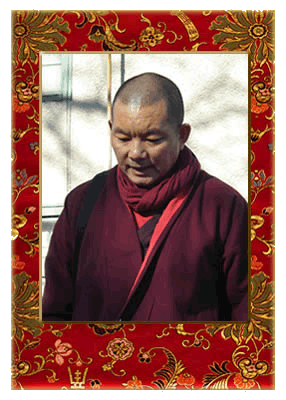 Subsequently, Rinpoche led the nuns from Tibet, and many of them still study with him today. In India, Rinpoche spent nine years at the settlement of Buxador, where he received his degree and title of khenpo from His Holiness the Karmapa. Rinpoche later received the geshe lharampa degree from His Holiness the Fourteenth Dalai Lama. In addition to having mastered the teachings of the Gelug and Kagyu lineages, Rinpoche also received extensive teachings from the former Dzongsar Khyentse Rinpoche of the Sakya tradition. Rinpoche received the complete Rinchen Terdzo initiations from H.H. Dilgo Khyentse Rinpoche in Bhutan, along with transmission of the Dzogchen text, Lam Rim Yeshe Nyingpo (The Gradual Path of the Heart of Wisdom), from Dilgo Khyentse Rinpoche when it was given to the King of Bhutan. Khenpo Tsultrim also built a nunnery, retreat center, and a temple to Tara in Bhutan. At the request of the Karmapa, Rinpoche went to Europe and began his work of training translators in both oral and written Tibetan. To this end, he set up the Thegchen Shedra in 1978, where over the years he has trained many Western translators who travel with lamas translating Tibetan into the various European languages. His students have also published numerous written translations. In 1985, Rinpoche established the Marpa Institute for Translators in Nepal, and he currently teaches a three-month, winter course at Pullahari monastery, the seat of H.E. 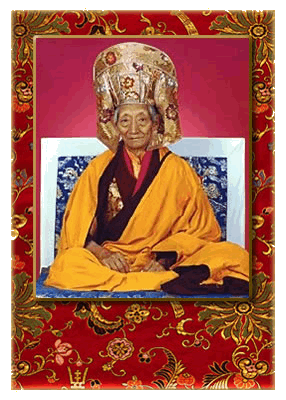 Jamgon Kongtrul Rinpoche. He has built retreat facilities near Milarepa's cave in Yolmo, where his students also practice. Together with Thrangu Rinpoche, Khenpo Tsultrim has been responsible for training the new generation of Kagyu Khenpos who graduated in 1991 from the Nalanda Institute in Sikkim. Khenpo Tsultrim, well-known in many Dharma centers in the U.S., Far East, and Europe, is famous for his skill in debate, his spontaneous songs, and his ability to present the complex ideas of Buddhism's subtle philosophy in clear, accessible, and lively way. Rinpoche travels yearly on teaching tours to the United States and Europe. Click here for more information about Khenpo Tsultrim Gyamtso Rinpoche's biography and activities. KHENPO UGYEN TENZIN was born on the 15th of March in 1955, the Year of Wood Sheep, in the Chumey Zungney village in the Bumthang valley of central Bhutan. As his mother had passed away during his very early childhood, he was raised by his father and maternal aunt. His father sent him to a new primary school that had just opened near their village so he could receive modern education. In 1971, when Khenpo Ugyen Tenzin was seventeen, he entered Nimalung Nyingma Monastery, which is situated closed to his home village. He received the refuge vow from His Eminence Bero Tulku Rinpoche, the father of Druk Thamche Khenpo. On July 10, 1974, during the time of summer retreat, Ugyen Tenzin received the pratimoksha novice vow from the celebrated Dzogchen Khenpo Dazer. He also received empowerments, transmissions, and teachings from many great lamas of the Nyingma lineage, such as His Holiness Dilgo Khyentse Rinpoche, Talung Tsetrul Rinpoche, Pema Norbu Rinpoche, and the most celebrated Khenpo Kunga. 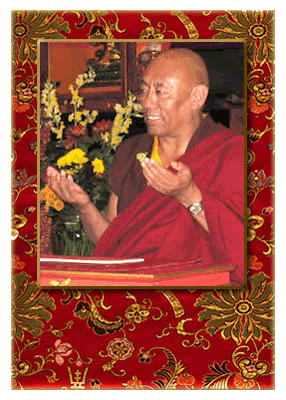 This completed his training in the Nyingma teachings and practices. with Dzogchen Ponlop Rinpoche and Sangay Nyenpa Rinpoche. Five months later, during the summer retreat, he received the vows of bhikshu—the fully ordained monk—from His Eminence Jomgön Kongtrül Rinpoche. In the Karma Shri Nalanda Institute, the vows of ordination are always conferred during the time of summer retreat. Khenpo Ugyen Tenzin completed his studies and received an Acharya degree (Master of Buddhist studies) from Karma Nalanda Institute and Sampurnanand Sanskrit University jointly in March 1991. On the 23rd of March of the same year, he was appointed as junior khenpo (professor) by His Eminence Jomgön Kongtrül Rinpoche and His Eminence Goshir Gyaltsap Rinpoche. Less than a month later, he was sent to Nimalung Monastery in Bhutan as a khenpo, where he taught Buddhist philosophy for six years. In 1997, Khenpo Ugyen Tenzin returned to Rumtek Monastery in Sikkim, and was appointed the senior khenpo at Nalanda Institute by His Eminence Gyaltsap Rinpoche. He had also visited Karma Kagyu dharma centers in Hong Kong, Malaysia, Singapore, Taiwan, and Thailand and conferred teachings to many devotees. He resigned as khenpo from Karma Shri Nalanda Institute in 2002, and returned to Bhutan. There he was asked to teach as senior khenpo at the Nimalung Monastery. However, he chose to go into retreat at Tang Kunzang Drag Monastery, the birthplace and main seat of the great treasure-revealer, Terton Pema Lingpa. He remained in retreat until October 24, 2004. As His Holiness the 17th Gyalwa Karmapa asked Khenpo Ugyen Tenzin to help Karma Triyana Dharmachakra, he left his retreat to go to KTD Monastery, where he arrived on May 27, 2005. On August 9th 2005, the auspicious day of Chokhor Duchen, when the Buddha first taught the Four Noble Truths (according to the General Tibetan Calendar), Khenpo Ugyen presented The Four Noble Truths as his first teaching at KTD. Since that time he has continued to teach at KTD as well as at many of the KTCs and KKSGs from such texts as Jamgon Kongrul Lodro Taye’s Treasury of Knowledge, Jamgon Mipham’s Gateway to Knowledge, Acharya Shura’s Wish-Fulfilling Vine, Totsun Trupje’s Praises to the Especially Exalted, Nagarjuna’s Letter to a Friend, Shantideva’s Guide to the Way of the Bodhisattva, Ngulchu Thokme Zangpo’s Thirty-Seven Practices of Bodhisattvas, Gampopa’s Ornament of Liberation, Lord Rangjung Dorje’s Aspiration of the Definitive Meaning, Mahamudra, Jiktral Yeshe Dorje’s Instructions on the Interval States, and King Songtsen Gampo’s Mani Kabum, among others. KHENPO TASHI GYALTSEN was born in 1970 into a farming family in Nangchen in Kham, Tibet. At age thirteen he decided to become a monk and received his novice monastic vows from Drubchen Karma Norbu Rinpoche at Raktrul Monastery, the monastery of Bardor Tulku Rinpoche. At fourteen, over the course of one year, he received the complete empowerments and reading transmissions of the Rinchen Terdzo (Treasury of Precious Terma) from Gyalmo Tulku Rinpoche of Gonzhab Monastery and Chime Tulku of Benchen Monastery. Following this he spent one year in Mahakala retreat in the Protector Shrine Room at Raktrul. Subsequently, he travelled to Chamdo to study the manuals on Dzogchen and Mahamudra practice and receive instructions from the renowned Kagyu master Khenpo Karma Tseten Rinpoche. Khenpo Tashi also received instruction on Madhyamaka and other philosophical schools. At Willow Mountain Retreat he spent a year and a half studying the traditions of sutra and mantra in addition to the classic Buddhist sciences. At nineteen, he embarked on seven years of study at Arig Shedra in Amdo with Khenchen Arig Padma Tsewang, focusing on the sutrayana and mantrayana treatises of the Nyingma school as well as those of the Kagyu and Sakya schools. He received profoundcommentary on Dzogchen from Khenchen Munsel and then, for three and a half years, studied under Khenchen Jigme Phuntsok at Larung Gar, his dharma encampment located in Serthar in lower Kham. At the age of 27, Khenpo Tashi went to Drepung Monastery in Lhasa where he studied for two years in the Gelugpa tradition. In 1999 Khenpo Tashi left Tibet and at the invitation of His Eminence Tai Situ Rinpoche, became a professor at the monastic college of Palpung Sherab Ling in Himachal Pradesh, India. He now serves as the dean of khenpos at Sherab Ling. In late 2002, as a guest of the United States-based Raktrul Foundation, he began a four-month tour of North America to teach at Raktrul's dharma center in Red Hook, New York; at Karma Triyana Dharmachakra; and at several Karma Thegsum Choling centers in the U.S.
LAMA NAMSE RINPOCHE was born in Tsurphu, Tibet in 1930 and became a monk at the age of fifteen. From ages 16 to 21, he did intensive studies of the basic fundamentals of Tibetan religious language, etymology, grammar, and poetry. He underwent the serious studies of the Tripitaka, Vinaya, Sutra and Abhidharma, and also the Prajna Paramita, Utara Shastra, Sutra Lankara, the five states of Madhyamika and many other versions and commentaries as well as schools of Buddhist thought and teachings. From ages 21 to 24, Lama Namse did a three-year, three-month, three-day retreat with intensive practice of the core of the Kagyu teachings such as the Six Yogas of Naropa, the meaning of Mahamudra, and other related practices. From ages 24 to 26, he studied Buddhism further, especially the Five Treasuries of Jamgon Kongtrul the Great. From ages 27 to 30, Lama Namse went on an intensive pilgrimage to many sacred places and private retreats. When he was thirty years old, Lama Namse left Tibet as a refugee. He travelled to India, and from ages 32 to 35, did another three-year retreat. At this time he also became a retreat master for many new retreatants. At age thirty-seven, he travelled to Sikkim to Rumtek Dharmachakra Centre and received the collections of the empowerments of the Kag Ngagzod, Damgang Ngagzod practices. Since 1974, Lama Namse has served as a teacher of the Kagyu lineage all over Europe, particularly in France, and helped many students understand the nature of the path. Lama Namse Rinpoche is His Holiness Karmapa's official representative in Canada and head of Karma Sonam Dargye Ling, the Canadian centre for His Holiness the Seventeenth Karmapa, Ogyen Trinley Dorje. The centre is located in Toronto. LAMA GANGA was born on July 13, 1931 at Ga Yul in Kham (eastern Tibet). He entered Thrangu Monastery at the age of thirteen. He studied extensively the fundamentals of the Tibetan dharma and memorized the scriptural foundation of Tibetan liturgy and rituals. He received monk's ordination as well as the Bodhisattva Vow and tantric precepts at age eighteen from His Holiness Rangjung Rigpe Dorje, the Sixteenth Karmapa. For ten years, he meditated in retreat on the Six Yogas of Naropa. Later, in India, he attended the Seminary for the Four Sects of Tibetan Buddhism, and he enhanced his practice still further at Thimpu in Bhutan and at Rumtek Monastery in Sikkim. In 1976, Lama Ganga came to the United States with Khenpo Karthar Rinpoche, and eventually he was appointed to be Karma Triyana Dharmachakra's representative in California. In the early 1980's, Lama Ganga traveled to Kagyu Samye Ling in Scotland to instruct students in a three-year retreat there, and subsequently he divided his efforts between California and Scotland, with an additional trip to Tibet in 1986 and 1987 with Thrangu Rinpoche. The day of Lama Ganga's passing was also the anniversary of the Buddha's turning of the wheel of dharma. 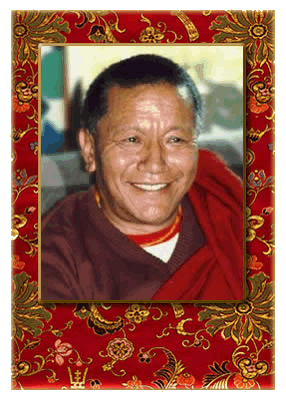 Lama Ganga's body remained in samadhi for five days following his death. "All students who received teachings or blessings from Lama Ganga should not feel sad, but rather should increase their practice and unite with Lama Ganga in the state of dharmakaya to receive his blessings for further progress toward enlightenment for the benefit of all beings." LAMA TASHI DONDUP was born in Tibet in 1952. From 1970 to 1988 he stayed at Rumtek Monastery in Sikkim, India, seat of His Holiness Karmapa, and received teachings on the major texts from Jamgon Kongtrul Rinpoche, Thrangu Rinpoche, Sal-je Rinpoche, and Khenpo Tsultrim Gyamtso Rinpoche. He also studied ritual music and procedures, such as the making of tormas, the construction of mandalas, and the building of stupas. He completed a three-year retreat at Rumtek and then entered a one-year Kalachakra retreat under Bokar Rinpoche's guidance in Mirik, in the Darjeeling district of India. In 1988 Lama Tashi went to Kamalashila Institute for Buddhist Studies in Germany, where he served as resident lama for ten years. 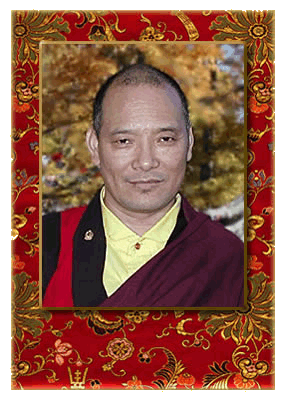 Lama Tashi moved to Toronto, Canada in 1998, and in 2002, he founded Karma Tekchen Zabsal Ling, a center located there. LAMA DUDJOM DORJEE was chosen by His Holiness the 16th Gyalwa Karmapa to guide the Karma Thegsum Choling students in northern California. He began his teaching in the United States in 1982 and is now the resident Lama at the Karma Thegsum Choling Dallas. 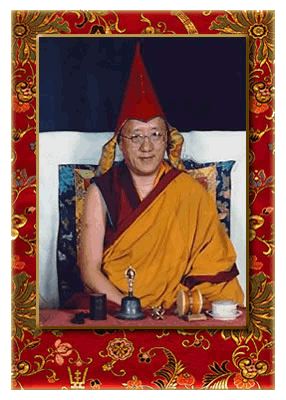 Lama Dorjee is noted for his humor and is able to synthesize his familiarity with Western culture and Buddhist philosophy to offer students unique insights into meditation practice. Lama Dorjee has trained for fifteen years in Buddhist philosophy, history, and four languages: Sanskrit, Hindi, Tibetan and English. He completed his course of study and received the third and highest degree of Acharya from Sanskrit University, Varansi, India. He accomplished the three-year, three-month retreat in India under the guidance of Kalu Rinpoche and other Kagyu lamas. DR. KARMA DRUBGYUD TENDHAR, whose family came from Tibet, was born in 1972 in Sikkim, India, near Rumtek Monastery. Although he began his schooling in his village, in 1982 he went to study at Rumtek Monastery. A few months after he arrived he became a monk under Jamgon Kongtrul Rinpoche and continued his monastic studies, specializing in the Karma Kagyu tradition of Tibetan Buddhism. In 1984 he was one of four monks chosen to study Tibetan astrology and during this time received teachings, initiations, and transmissions from many great teachers. He completed his monastery courses in 1987 and went to Dharmasala, India, to study Tibetan medicine and continue his studies in Tibetan astrology. Traditionally in the large monasteries one or two monks must study astrology and medicine, and Dr. Drubgyud was selected to attend Meen tse Kang, the Tibetan Medical and Astro Institute of His Holiness the Dalai Lama in Dharamsala. In 1991 Dr. Drubgyud completed his medical studies and graduated with honors as a doctor of Tibetan medicine. The following year he completed two six-month internships: one at the Medical Institute in Sikkim and the other at the Main Medical Institute in Dharmasala. While at the Main Medical Institute he worked with Dr. Lobsang Wangyal, personal physician to His Holiness the Dalai Lama. In 1993 Dr. Drubgyud completed his medical training and became a doctor at the Tibetan Medical and Astro Institute's branch clinic in Ladakh. In 1993 Dr. Trogawa Rinpoche asked Dr. Drubgyud to assist him in founding the Chakpori Medical Institute in Darjeeling. Dr. Drubgyud was subsequently appointed lecturer and taught the entire curriculum of Tibetan medicine at the Institute for four years while working at its medical clinic and pharmacy. In 1997 he was asked to upgrade the Tsurphu Astrology System, a project sponsored by Dzogchen Ponlop Rinpoche, and Dr. Drubgyud worked with Dragthon Jompa Gyaltsen in Dharamsala to upgrade this special astrology calculation system. When the project was completed, Ponlop Rinpoche invited Dr. Drubgyud to the United States to develop computer software for Tibetan astrology. His visit provided him the opportunity to take English and computer science classes at the University of Colorado. He has since practiced medicine at Karma Thekchen Choling, His Holiness Karmapa's center in Vancouver, Canada. In 1999 he visited Karma Triyana Dharmachakra where he taught seminars on Tibetan medicine and treated patients. Dr. Drubgyud is currently the resident lama at Kamalashila Institute in Germany. 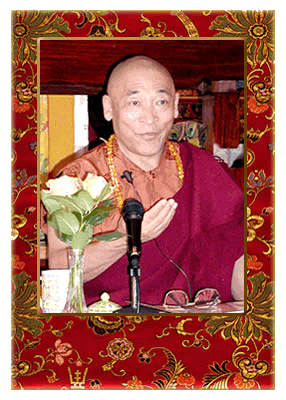 Lama Karma Samten was born in 1947 in West Tibet, at Gertse. His parents were originally from East Tibet, but whilst on pilgrimage to Mt. Kailash they decided to settle there. When Lama Samten was five, he went to live with one of his uncles at a Sakya monastery. It was here where he first took refuge, and spent five years with his uncle who was his first teacher. Lama Samten was ten when the Communist army invaded Tibet. He managed to escape with his family, the journey being very long and arduous; many people died on the way. Lama Samten and his family arrived in Nepal along with thousands of other refugees escaping from Tibet. Lama Samten’s family were among the many refugees that became very sick as a result of the journey and living in a different climate. Most of them died, and out of Lama Samten’s thirteen family members, only three survived the flight from Tibet. By the age of thirteen Lama Samten’s father had died, so he had now lost his entire family. At the age of twenty-one Lama Samten took ordination from Khyabje Kalu Rinpoche and entered the traditional three year retreat, which he completed twice in succession. Following this, he spent a further three years in solitary retreat. Lama Samten had hoped to spend the rest of his life in retreat, but at the request of His Holiness The Sixteenth Gyalwa Karmapa he went to New Zealand with Lama Shedrup to be a resident teacher at Karma Choeling Buddhist Monastery north of Auckland. For more than twenty years, Lama Samten has taught Tibetan Buddhist principles and practice in plain English to a growing number of students in Australasia. In 2002 he published a book, Living with Death and Dying, and visited the United States for the first time. UMDZE LODRO SAMPHEL is the senior umdze, or chant master, at Rumtek Dharma Chakra Centre in Sikkim, India, the international seat of His Holiness the Gyalwa Karmapa. During a course of study that spanned twenty years, he mastered the multifaceted role an umdze plays in the ritual life at Rumtek. He is responsible for overseeing every aspect of Tibetan Buddhist rites at the monastery, and consequently his training included extensive text memorization, the study of musical instruments and chanting, the construction of tormas (ritual offerings) and colored-sand mandalas, and sacred monastic dance. Born in 1959 in Sikkim to parents who were originally from Tsurphu in Tibet, Umdze Lodro entered Rumtek Monastery and became a monk when he was seven. His monastic training began with study of the ritual texts, which continued for nine years. In the Tsurphu tradition in which he was schooled, there are thirty different sets, or classes, of texts that must be memorized. One by one, he demonstrated his mastery of the texts to his teacher, earning a seal for each to signify his successful recitation from memory. At sixteen, to celebrate completing this part of his education, Umdze Lodro hosted a party for his teachers and fellow monks in keeping with tradition at the monastery. For the next two years, he studied to be a choyog, or shrine master, with Lama Solpon Jinpa. Umdze Lodro learned to make the different tormas for each of the pujas (ritual practices) and mastered the intricate details of tending the shrine during the services, including the placement and removal of specific tormas and other sacred objects at prescribed times. He concluded this phase of study by presenting the various tormas he made to the Sixteenth Karmapa, who conferred his seal thus indicating they were properly constructed. Umdze Lodro began to study chanting with Umdze Thubten Zangpo in 1978 and spent a year as an assistant of chant, followed by eight years as a junior chant master when he studied the chant melodies and learned to play all the ritual instruments, including the rolmo (cymbals), drums, gyaling (shawm), and flute. He also learned to construct all the sand mandalas: the symbolic, celestial palaces of the wrathful and peaceful deities like Kalachakra, Vajrayogini, and Chakrasamvara. This was followed by a period studying sacred dance. In 1986, at age twenty-seven, Umdze Lodro completed his studies and became an umdze. He is one of three umdzes at Rumtek, and has three assistant umdzes who study with him. He is also responsible for the training of seventeen monks at the monastery. With His Eminence Jamgon Kongtrul Rinpoche, Umdze Lodro visited North America in 1991, where they performed the Kalachakra empowerment in Toronto, and the Shi Tro empowerment at Karma Triyana Dharmachakra Monastery (KTD) in Woodstock, New York. 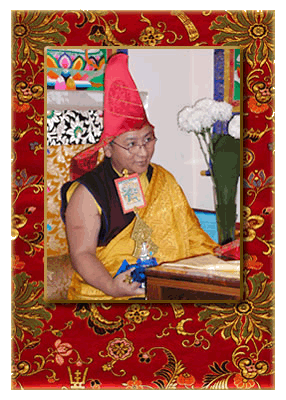 In 1998 at the request of Bardor Tulku Rinpoche, Umdze Lodro returned to KTD to record authentic Kagyu chanting and pujas, and to teach on the ritual aspects of tantric practice. Karma Kagyu Institute (KKI) has already released two of the recorded chants: the Green Tara Chants, and Medicine Buddha Chants. 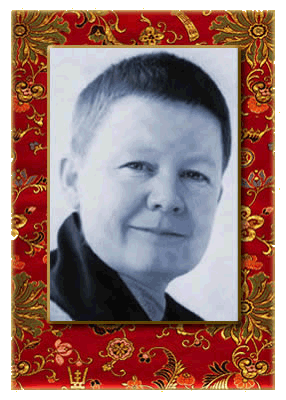 AS A FULLY ORDAINED BHIKSHUNI, or Buddhist nun, Pema Chodron is one of a very small number of Western women, one of an even smaller number of women involved in the Tibetan tradition, and certainly the first American practitioner of the Vajrayana tradition to undergo the preparation and ceremony of full ordination. Ani Pema Chodron was born Deirdre Blomfield-Brown in 1936, in New York City. She attended Miss Porter’s School in Connecticut and graduated from the University of California at Berkeley. She taught as an elementary school teacher for many years in both New Mexico and California. Pema has two children and three grandchildren. Pema first met her root guru, Chogyam Trungpa Rinpoche, in 1972. Lama Chime encouraged her to work with Rinpoche, and it was with him that she ultimately made her most profound connection, studying with him from 1974 until his death in 1987. 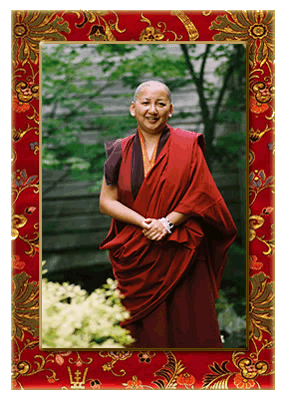 At the request of the Sixteenth Karmapa, she received the full bikshuni ordination in the Chinese lineage of Buddhism in 1981 in Hong Kong. Ani Pema served as the director of Karma Dzong in Boulder, Colorado until moving in 1984 to rural Cape Breton, Nova Scotia to be the director of Gampo Abbey. Chogyam Trungpa Rinpoche gave her explicit instructions on establishing this monastery for western monks and nuns. Ani Pema teaches in the United States and Canada. She plans for a simplified travel schedule with an opportunity for an increased amount of time in solitary retreat under the guidance of Dzigar Kongtrul Rinpoche. She is also interested in helping establish Tibetan Buddhist monasticism in the West, as well in continuing her work with western Buddhists of all traditions, sharing ideas and teachings. Click here for more information about Pema Chodron activities. LAMA KARMA CHOPAL was born in East Tibet in 1965, and became a monk at the age of eleven. At fifteen he became a student of Sonam Nyima, the most advanced master of iconographic art in the Karma Kagyu Lineage. He studied Buddhist thangka painting, mandala design, and other art forms for ten years. In 1989, Lama Chopal went to India to complete his monastic training at the major Kagyu monasteries. He studied at Rumtek, the monastery of the Karmapa, and completed his three-year retreat at Sherabling under Mingyur Rinpoche. Thereafter he spent three additional years at Sherabling studying Tibetan monastic arts of torma making, ritual music, and chanting. Lama Chopal studied Buddhist philosophy at Dzongsar College in India for six years. Following studies in advanced meditation with Bokar Rinpoche, Khenpo Tsultrim Gyamtso Rinpoche, and other Kagyu lamas in India and Nepal, Lama Chopal came to the U.S. in 2001. He completed two stupas over the course of six years for Kagyu Thubten Choling in New York state, and Samchenling in Virginia. 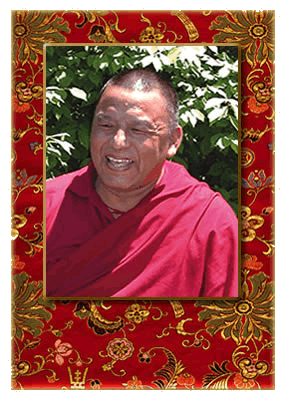 In 2007, his root teacher, Tai Situ Rinpoche, requested that Lama establish a Dharma Center in Charlottesville, VA.